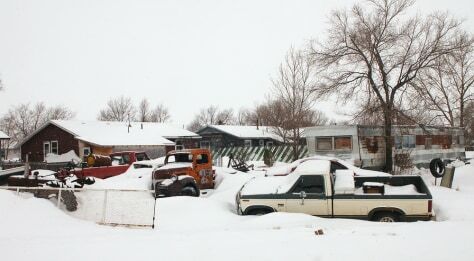 Old vehicles are covered with snow outside a row of run-down houses in Eagle Butte, S.D. In the barren grasslands of Ziebach County, there's almost nothing harder to find in winter than a job. This is America's poorest county, where more than 60 percent of people live at or below the poverty line.